How did a Texan end up in the Northwest? Honestly, my wife, who also is an actor, and I needed a home base in the same city. We had been taking regional jobs a few months at a time, but found it perpetually stressful. We did some research and determined Chicago and Seattle were the top candidates for a city with actual work for actors. Seattle was just far enough away that it felt like a fresh start and a big enough challenge with sustainable work. What do you think fuels Huck's appeal? I wonder whether that same "appeal" would exist if it were a middle-aged man running away with Jim. Aside from Huckleberry Finn being one of our country's most popular and culturally important novels, there is something extremely endearing about the character. His straightforwardness is refreshing, and his youth creates a kind of clean slate of morality. I believe we all root for Huck because, in the end, he always does the right thing and that gives us hope. Roger Miller's fantastic score for "Big River" includes such a variety of songs: funny, dark, and sweet. What's your favorite? It's true. Never a dull moment or a song you don't look forward to! Easily, "Worlds Apart" is the most enjoyable moment in the show and the largest learning moment for Huck. As a baritone, you must have notice your voice type quite often doesn't get the girl—either they are the villain in opera or the funny sidekick in musicals. What's your favorite baritone roles? And what role would make you want to sing tenor? Ha! You noticed this trend! At least these days.... Unfortunately, I look like a tenor, so I am having to adapt until the baritone makes his return in new musicals. However I love being a baritone. Most of the roles I want to play are baritones! On your website, you advertise your home studio for voiceover work. How did you get started in that? What's some of the advantages of being an actor in a digital age? I had always wanted to get into voiceovers, but being a theater nomad, I didn't have a home base to get an agent or an apartment in which to plop down a studio. So as soon as I moved here, I got my demo, equipment, and started playing around with it. Being an actor today is awesome. Everything is digital so it makes business simpler. But it also means being careful to not spread yourself too thin and staying on top of an instant market. 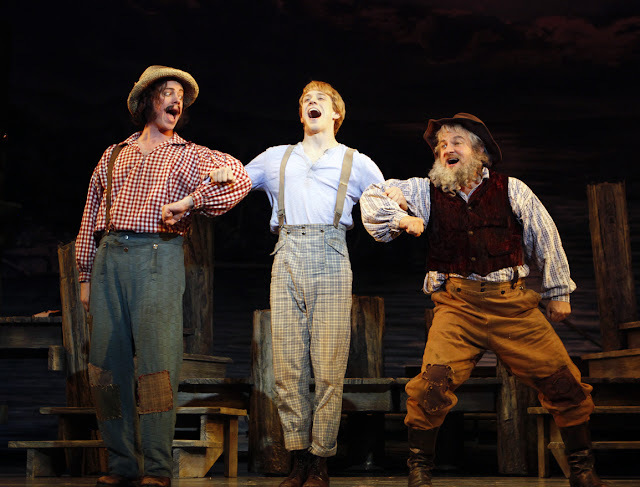 After "Big River" closes, where will we see you next? I will be playing Agustus Fink-Nottle, the newt-loving hapless lover, in Taproot Theatre's "Jeeves in Bloom" in February. This article originally appeared in a different format. The Duke (Greg McCormick Allen), Huck (Randy Scholz), and The King (Richard Grey). Photo by Jay Koh, courtesy of Village Theatre.